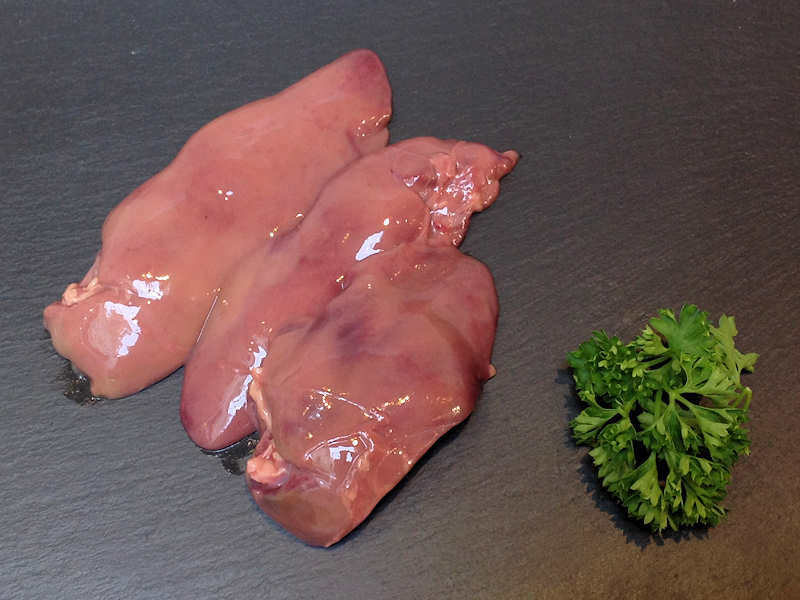 The liver of mammals, fowl, and fish is commonly eaten as food by humans. 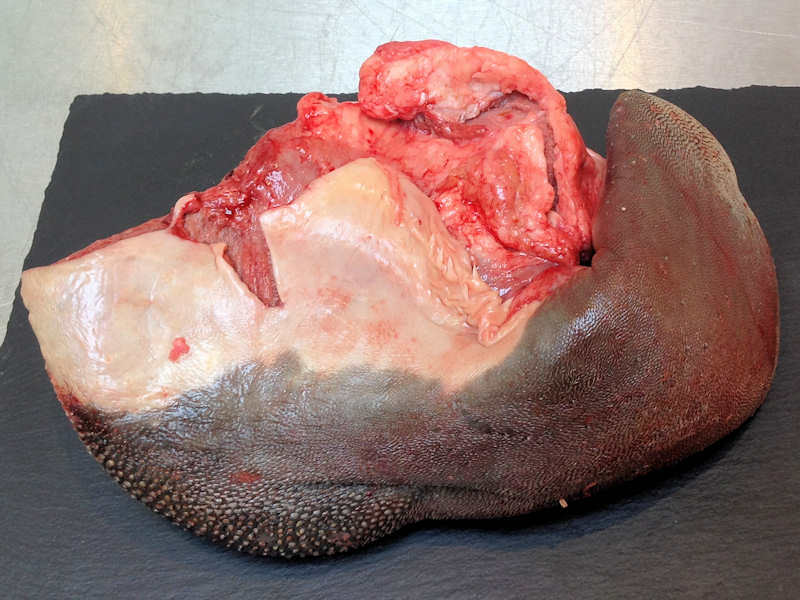 Domestic pig, ox, lamb, calf, chicken, and goose livers are widely available from butchers and supermarkets. 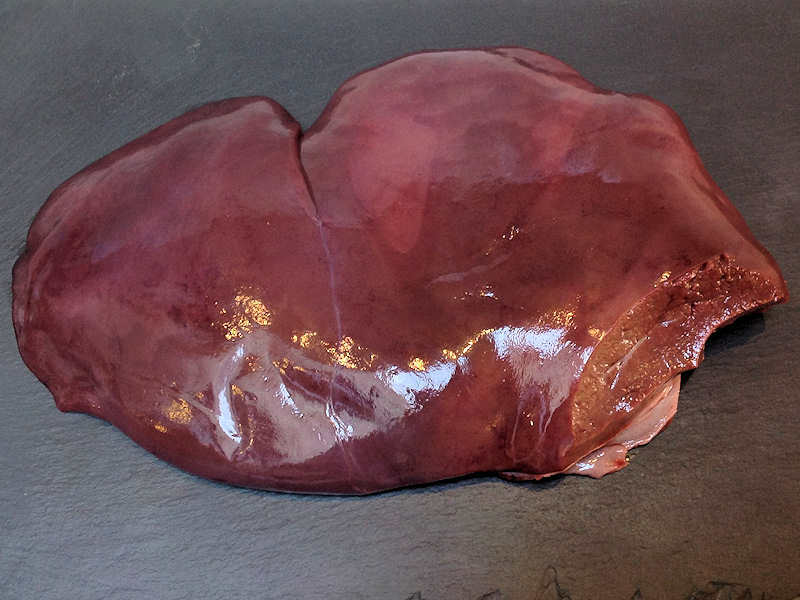 Animal livers are rich in iron, copper and preformed vitamin A. 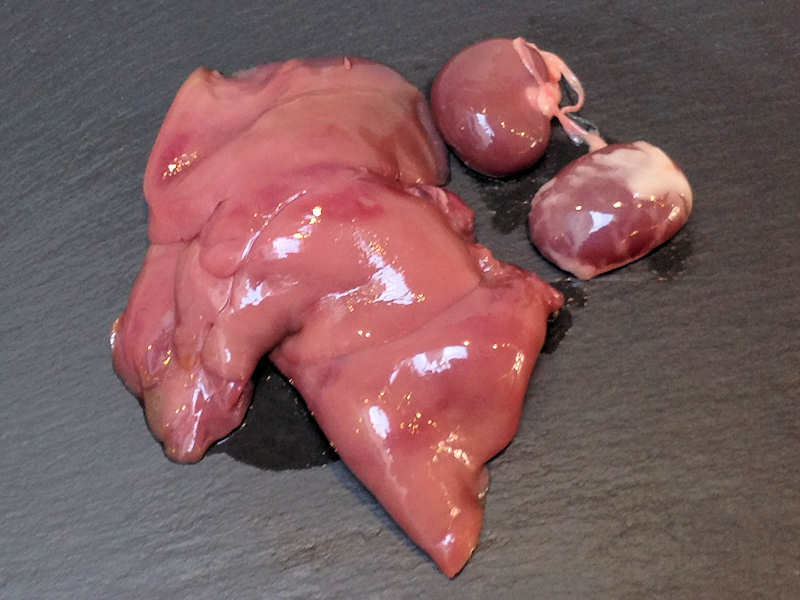 Traditionally, some fish livers were valued as food, especially the stingray liver. It was used to prepare delicacies, such as poached skate liver on toast in England, as well as the beignets de foie de raie and foie de raie en croute in French cuisine.Cod liver oil is commonly used as a dietary supplement. An uncooked small haggis. In medieval times, "Humble pie" (originally, "Umble pie") made from animal innards (especially deer) was a peasant food and is the source of the commonly used idiom "eating humble pie", although it has lost its original meaning as meat pies made from offal are no longer referred to by this name. The traditional Scottish haggis consists of sheep stomach stuffed with a boiled mix of liver, heart, lungs, rolled oats and other ingredients. In the English Midlands and South Wales, faggots are made from ground or minced pig offal (mainly liver and cheek), bread, herbs and onion wrapped in pig's caul fat. Steak and kidney pie (typically featuring veal or beef kidneys) is widely known and enjoyed in Britain and Ireland. Brawn is a British English term for "head cheese", or the collection of meat and tissue found on an animal's skull (typically a pig) that is cooked, chilled and set in gelatin. Another British and Irish food is black pudding, consisting of congealed pig's blood with oatmeal made into sausage-like links with pig intestine as a casing, then boiled and is usually fried on preparation. Luncheon Tongue refers to reformed pork tongue pieces. Both kinds of tongue are found in tinned form and in slices. Home pressing and cooking of tongue has become less common over the last fifty years. Bleached tripe was a popular dish in Northern England with many specialist tripe shops in industrial areas: these too have almost all closed. Pieds paquets, a regional specialty of Marseille and southern France. Andouillette from Troyes on sale at a charcuterie in Montmartre, Paris. In France, the city of Lyon is well known for its offal: andouillette, tablier de sapeur (breaded tripe), foie de veau, rognons à la crème, tripes... In Marseille, lamb's trotters and a package of lamb tripe are a traditional food under the name "pieds et paquets". In France, chitterlings sausage is regarded as a delicacy called andouillette. Especially in southern Germany, some offal varieties are served in regional cuisine. The Bavarian expression Kronfleischküche includes skirt steak and offal as well, e.g. Milzwurst, a sausage containing small pieces of spleen, and even dishes based on udder. Swabia is famous for Saure Kutteln—sour tripes, served steaming hot with fried potatoes. Herzgulasch is a (formerly cheaper) type of goulash using heart. Liver is part of various recipes, such as some sorts of Knödel and Spätzle, and in Liverwurst. As a main dish, together with cooked sliced apple and onion rings, liver (Leber Berliner Art, liver Berlin style) is a famous recipe from the German capital. Helmut Kohl's preference for Saumagen was a challenge to various political visitors during his terms as German Chancellor. Markklößchen are small dumplings made with bone marrow; they are served as part of Hochzeitssuppe (wedding soup), a soup served at marriages in some German regions. In Bavaria, lung stew is served with Knödel, dumplings. In the Austrian, particularly Viennese cuisine, the Beuschel is a traditional offal dish. It is a sort of ragout containing veal lungs and heart. It is usually served in a sour cream sauce and with bread dumplings (Semmelknödel). In Belgium several classic dishes include organ meat. Beef or veal tongue in tomato-Madeira sauce with mushrooms and kidneys in mustard cream sauce are probably the most famous ones. The famous "stoofvlees" or carbonade flamande, a beef stew with onions and brown beer, used to contain pieces of liver or kidney, to reduce the costs. Pork tongues are also eaten cold with bread and a vinaigrette with raw onions or some mustard. 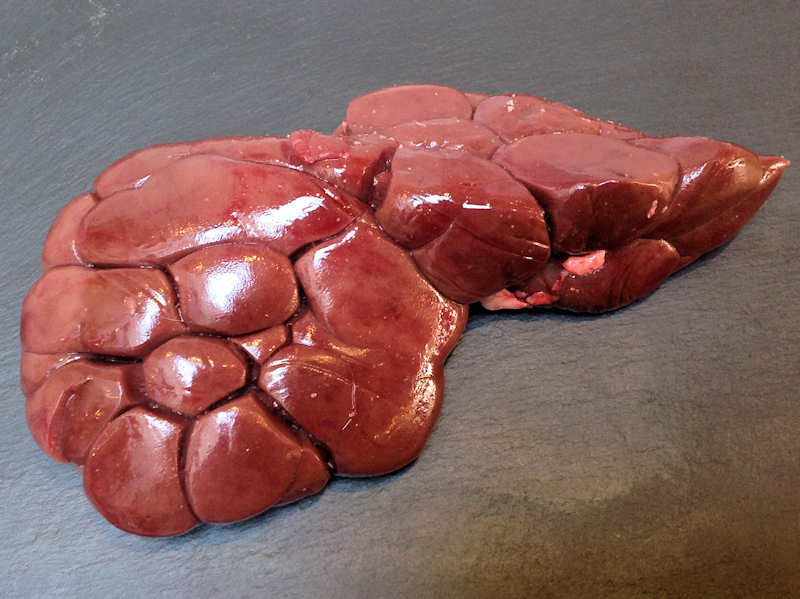 (and similarly in Turkey, Albania and the Republic of Macedonia), splinantero consists of liver, spleen, and small intestine, roasted over an open fire. A festive variety is kokoretsi (from Turkish kokoreç, Macedonian kukurek), traditional for Easter; pieces of lamb offal (liver, heart, lungs, spleen, kidney and fat) are pierced on a spit and covered by washed small intestine wound around in a tube-like fashion, then roasted over a coal fire. Another traditional Easter food is magiritsa, a soup made with lamb offal and lettuce in a white sauce, eaten at midnight on Easter Sunday as an end to the lenten fast. Tzigerosarmas (from Turkish ciğer sarması, meaning "liver wrap") and gardoumba are two varieties of splinantero and kokoretsi made in different sizes and with extra spices. Shkembe chorba. In Romania, there is a dish similar to haggis called drob, which is served at Easter. Romanian peasants make a kind of traditional sausage from pork offal, called caltaboş. The main difference being that drob is enclosed in abdominal membranes (prapore) of the animal, while chitterlings is used for caltaboş. A popular dish of tripe soup called ciorbă de burtă is similar to shkembe chorba. Also in Bulgaria, Republic of Macedonia and Turkey, shkembe chorba is a widespread soup variety. 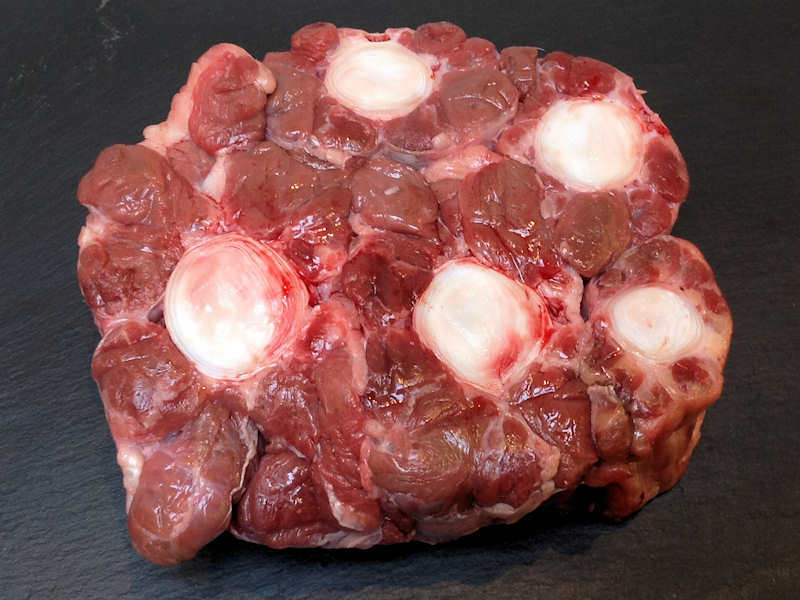 There is also a twofold variation on the concept of head cheese: piftie which does contain gelatin, is served cold and is usually only made from pork or beef (traditionally only pork), but does not contain as much head material (usually only the lower legs and ears are used since they contain large amounts of gelatin) and pacele which is exclusively made of meat and tissue found on the head (save for the eyes and usually only made from lamb; addition of brain and tongue varies by local habit). Pacele is made by first boiling the head whole (to soften the meat and make it easier to peel off) and then peeling/scraping off all meat and tissue from it. A generous amount of garlic or garlic juice, the mujdei, is then added and the dish is served warm. Finally, there are many dishes in Romania that are based on whole offal, such as: grilled pig and cow kidney (served with boiled or steam cooked vegetables—usually peas and carrot slices); butcher's brain called creier pane (usually lamb's brains, rolled in batter and deep-fried); tongue and olives stew (mostly done with cow tongue) and many others. The Armenian traditional dish known as khash is a traditional meal with inexpensive ingredients, originating in the Shirak region. The main ingredient in khash is pig's or cow's feet, although other animal parts, such as the ears and tripe, may also be used. Formerly a nutritious winter food for the poor, it is now considered a delicacy, and is enjoyed as a festive winter meal. In Hungary, a variety of traditional dishes are based on offal. A popular spicy stew, considered a national dish, is made from beef tripe. Ground or chopped pork offal is usually made into a hearty sausage known as "disznósajt" (lit. "pork cheese") somewhat resembling haggis. Stews and puddings made with blood (poultry, pork or beef) are also quite common. While decreasing in popularity, stews made from poultry testicles are still considered a delicacy and a dish of high prestige in the countryside. Offal is not an uncommon ingredient in Polish cuisine. Kaszanka, a traditional sausage similar to black pudding, is made with a mixture of pig's blood, pig offal and buckwheat or barley usually served fried with onions or grilled. Beef tripe is used to cook a soup simply called flaki (pl. guts). Chicken gizzards can be a base for various soups, such as krupnik, a pearl barley soup (not to be confused with a vodka of the same name). 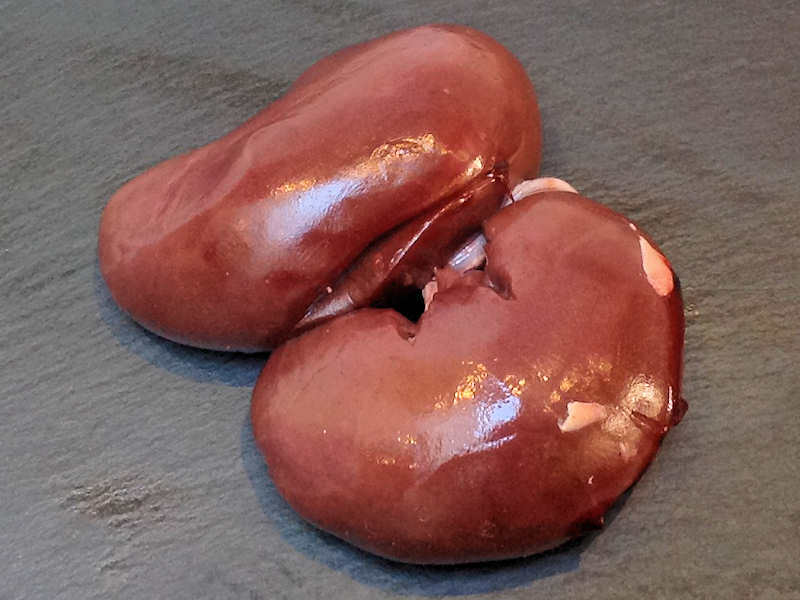 Pork, beef or veal kidneys, known in Polish as cynadry, are typically braised and eaten as a main dish. Pork tongues can be served hot, in a sauce, or cold, set into aspic. 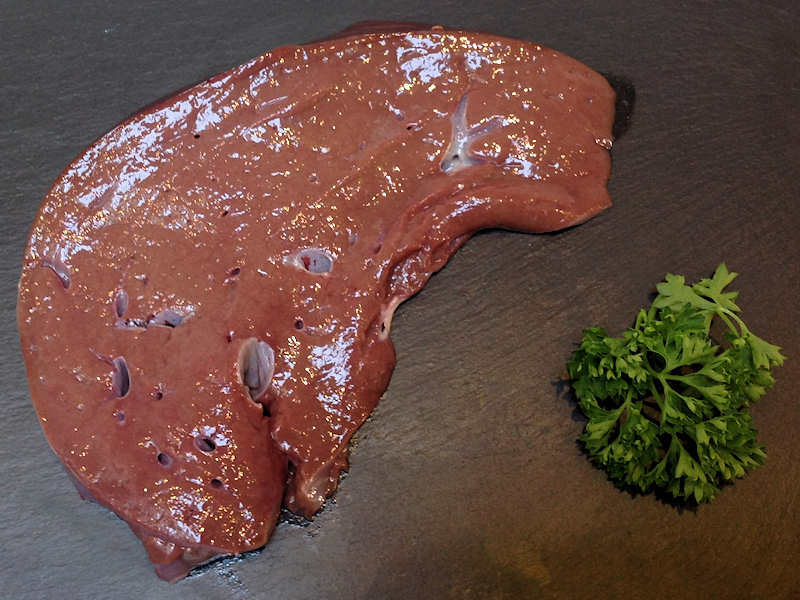 In Russia beef liver and tongue are considered valuable delicacies, which may be cooked and served on their own. 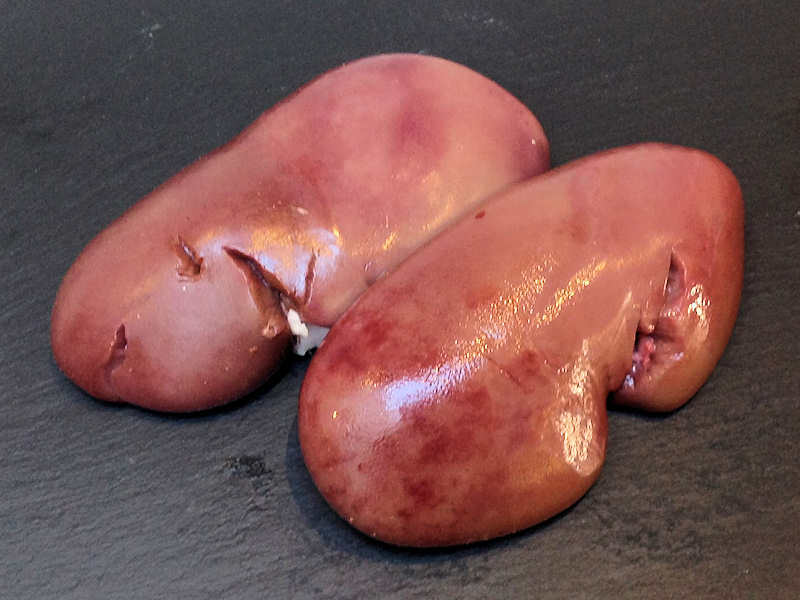 Kidneys and brains are sometimes used in cooking. 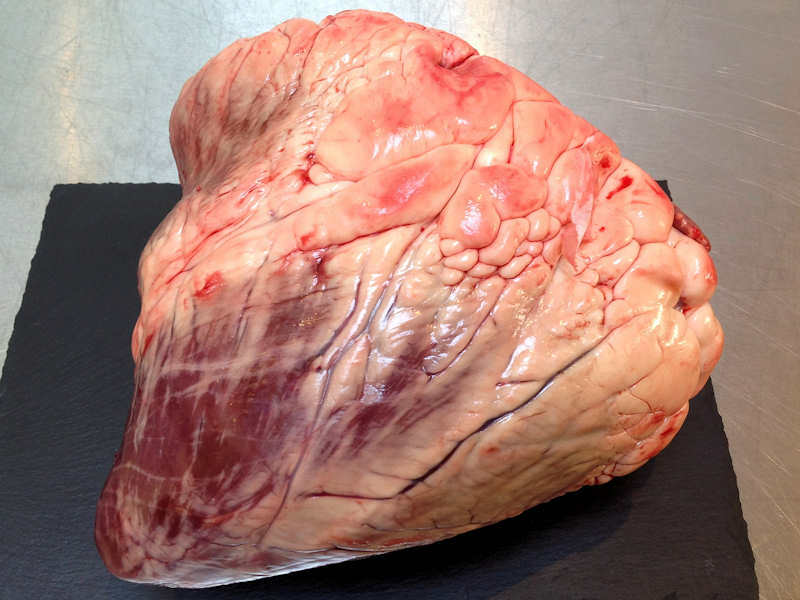 The heart is often eaten on its own or used as an additive to the ground meat, as do lungs which give a lighter, airier texture to it. Pig's or sheep's stomach is sometimes used for nyanya, a dish similar to haggis. Head and collagen-rich extremities are used to make kholodets—a version of aspic, whereby these body parts are slowly boiled for several hours with meat and spices, removed and discarded, and the remaining broth is cooled until it congeals.